Hey WINNER! 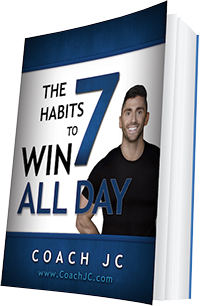 The fact that you are reading this right now tells me that you want to BE YOUR BEST in life and WIN ALL DAY. Well, you are in the right place because that is what I can help you do. 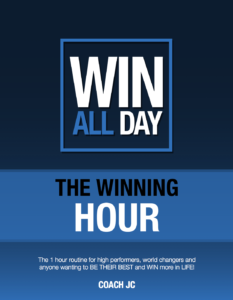 If you’re asking, “Coach JC, what do you do to WIN?” My answer is always the same, “I create WINNING daily routines, that I choose to do over and over again until they become habits in my life.”That is what I want to give you today, one of my daily routines that will set you up to WIN ALL DAY! I started following these routines back in 2003 when I was at my lowest point in life: depressed, desperate, down and out, over $400k in debt, in the fight of my life to be a father, facedown, and contemplating suicide.